That's right, NO podium finish for me, NOT even top 10. I forgot that I have friends who are in the same age category as me and are more faster than me. Congratulations to the winners and I will upload the Winners' photo at a later date. At least I'm in top 20. 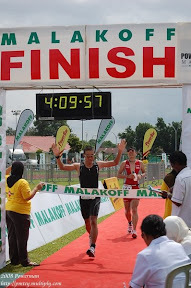 Next project -> PBC Duathlon in Miri - 11th December 2010.